Hot chocolate usually runs a bit too sweet for my taste buds to savor, so I have basically stopped enjoying this truly comforting drink. 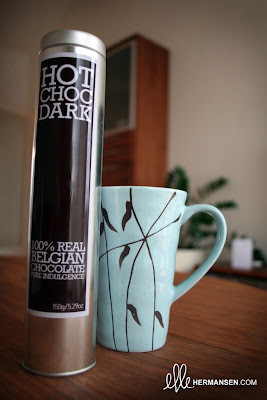 I was out shopping yesterday, saw a snazzy container marked "Hot Choc Dark" - and thought; Mmmmmm! I love Belgian chocolate! Like it says on the tin packaging, it's "pure indulgence!" It's true brilliance in a can! I mix it up with my lactose-free milk (I know, but my tummy can't handle regular milk). They are actually little chocolate chips that you melt in your hot milk, and then stir it up till it's a delicious hot cocoa beverage. Serve and enjoy all the tasty Belgian hugs within a cup!